Big Jelly Studios is housed in a recently converted Methodist Chapel in Ramsgate, Kent. Located right on the Kent Coast, Thanet is enjoying a huge renaissance as musicians, producers and artists move to the area in search of ways of maintaining a creative lifestyle. The highspeed train link and recent road improvements make travelling to Thanet quick and easy - it's 1 hour 15 minutes from Kings Cross St Pancras. The Studio is a five minute walk from Ramsgate Rail Station and a ten minute walk from the beach. We have parking for a splitter van on our forecourt, making loading easy if you're travelling to us by road. Walking into the building you immediately get the sense of a space that has character and is built around making clients feel relaxed and creative. The lounge/dining space has various retro games consoles, DVDs and a reference stereo. The double arch doors lead into our main live room with full height Chapel ceiling and full natural light thoughout. The roof has been fully re-structured to bear the load of soundproof materials and finished in an architectural plaster (present throughout the building) with an arch to restore the buildings natural acoustics. 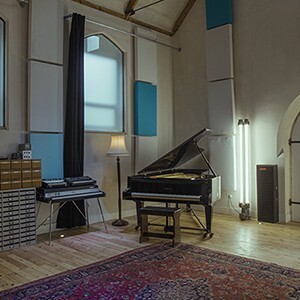 The live room boasts a 10 ft Elysian Concert Grand Piano, Hammond C3 with Leslie, Fender Rhodes and much more (see equipment list). Other features include our ever popular SLIDE (best mode of transport downwards), next to which the stairs up to our Control A sit. With forward leaning glass, our Control A room has great sight lines down into the main live room and has accurate monitoring whilst tracking. Following on from our main live room are two decent size booths, which enhance the flexibility of the space for tracking live projects. Our control room B is a networked room with the capability to record in any of our spaces. Off from control room B is our 'dead room', which can be used for vocal work, sound replacement or even as an amp room. Towards the back of the building we have the kitchen and bathroom, with all relevant equipment for self catering. A spiral staircase leads up to our bedroom; a medium sized and comfortable space with 5 beds and skylights suitable for bands on a budget. We have close links with local B&Bs for those requiring that option. Thanet has a lot of great options for live music, art and a plethora of boho vibe cafes and bars.